Northampton Community Television is a community media center and public access TV station. We equip our community to create multimedia content such as television and web videos, by providing equipment, training, and expertise. 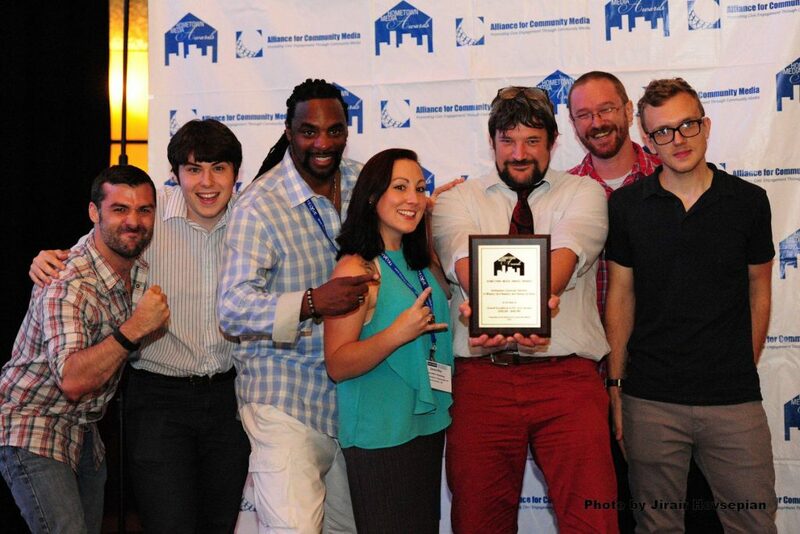 We’ve become a nationally recognized leader in redefining community and public media. Our mission is to serve as a model community media organization providing programming and educational opportunities to the community through all means technologically available. We have educated hundreds of community members, provided hundreds of thousands of dollars in free equipment to makers, have pioneered next generation multimedia youth programs, and produced thousands of hours of programming. We have initiated a citizen journalism program that put news creation and storytelling in the hands of the public. In 2013, we started Cinema Northampton, a free movie night open to the public. Cinema Northampton grew into a monthly event with help from other community organizations. We also screen locally made films as part of our initiative called Focus Locus, held monthly at The Parlor Room in Northampton. In 2014 we created the 7 Day Film Sprint, a community filmmaking project where participants write, shoot, and edit short films in 7 days. In 2015 we commissioned teams across New England to recreate scenes from a popular movie, and pieced them together for a project we call “Crowdsourced Cinema.” In 2015 we recreated Indiana Jones and the Raiders of the Lost Ark. In 2016 we recreated the cult classic The Princess Bride. Also in 2015 we organized the Northampton Film Festival, formerly known as the Northampton International Film Festival. The film festival brings international and local narrative films, documentaries, and shorts to Northampton, all curated by a committee of media professionals and film lovers. In 2016 an interactive element was added to the film festival when we hosted a day of free virtual and augmented reality demos for the public. This was a part of our partnership with Brookline Interactive Group called The Public VR Lab. For three years in a row we were honored with awards for best web sites in the United States for community media organizations with budgets under $300,000. In 2016 we were awarded Best Overall Excellence in PEG Access within our budget range. Our staff has held leadership positions and participated in national arts organizations such as the ACM, NAMAC, NATOA, and NTEN, and statewide organizations like the Massachusetts Production Coalition and Mass Access, and local coalitions like the Northampton Prevention Coalition. We have been and are pioneers in our region for integrating, collaborating, and expanding the concept of how community media is defined. We are independent hyperlocal media. We are a physical public makerspace. We are a legal street art multimedia wall. We are an economic development organization. We provide opportunities for voices that do not have other opportunities. We provide free services to local nonprofit organizations and professional multimedia community. Currently, we have editing suites featuring Adobe Premiere CC, After Effects CC, 10+ DSLR cameras plus a variety of other camera options, lighting, audio equipment, stabilization, and more all available to members to utilize at a nominal yearly membership fee. To sign up for membership, click Sign up for Membership. For more information, check our Frequently Asked Questions.